GSA Administrator Martha Johnson continues to get her leadership team in place — today, Johnson announced that Kathleen Turco, GSA’s current chief financial officer, will lead GSA’s Office of Governmentwide Policy. Kathleen Turco has been a responsible, effective Chief Financial Officer for GSA for the past eight years,” said Martha Johnson, Administrator of General Services. “She knows the importance of providing exceptional services to the federal government at best value to the taxpayer and will use this experience well in leading the Office of Governmentwide Policy as we continue to develop and implement management and internal operations policies across government. Turco will start on May 3, the same day that Michael Robertson will take over as GSA’s chief of staff. Micah Cheatham, GSA Budget Director, will take over as GSA’s acting CFO, according to Sahar Wali, GSA’s deputy associate administrator for communications and marketing. Robertson will continue to serve as the chief acquisition officer and White House liason until replacements are found, Wali said. Insiders tell the DorobekINSIDER that Turco is very excited about the opportunities with GSA’s Office of Governmentwide Policy. OGP has been widely seen as directionless for awhile, and Turco has told friends that she is excited about working on important policy issues that can help government operate better. Turco has received kudos for her work as GSA’s chief financial officer, including the recently issued “citizen report,” which explains GSA’s budget. Turco joined Federal News Radio’s Tom Temin from IRMCO earlier this month. Hear that conversation here. The Office of Governmentwide Policy was created in December 1995 to consolidate its policy functions into a single organization. “OGP’s policymaking authority covers the areas of personal and real property, travel and transportation, information technology, regulatory information and use of federal advisory committees. OGP’s strategic direction is to ensure that governmentwide policies encourage agencies to develop and utilize the best, most cost effective management practices for the conduct of their specific programs,” the OGP web site says. 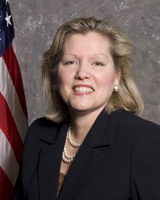 Kathleen M. Turco was appointed the Chief Financial Officer (CFO) for the U.S. General Services Administration (GSA) on August 5, 2002. In her capacity as the agency’s CFO, she provides enterprise-wide leadership for strategic planning, financial and budgetary analysis, performance budgeting, portfolio management, systems life cycle management, business case methodology and internal control processes and procedures. She provides the executive leadership and direction in administering the GSA’s Performance Management Process including the agencywide strategic planning, performance budgeting, financial management, and the core financial management system. She serves as principal advisor to the GSA Administrator on federal financial management, ensuring compliance with financial policies governing the $17 billion in financial activity for federal buildings, acquisition management, citizen services and governmentwide policy. The GSA Office of the CFO (OCFO) is an Office of Management and Budget (OMB) designated Financial Management Line of Business (FMLoB) Shared Services Provider (SSP). OCFO offers “corporate” shared financial management services to GSA and more than 50 external customers by providing: high quality financial management services including strategic planning; budget and performance management; labor forecasting and distribution; financial analysis; financial operations (accounts payable, accounts receivable, cost allocation, asset management); ePayroll; travel management (E-Gov Travel), charge card (travel and purchase), financial reporting; internal controls and audit follow-up. Ms. Turco came to GSA from the Internal Revenue Service (IRS). At IRS she served as the Director of Financial Policy, Planning and Programs in the Office of the Chief Information Officer from 2001 to 2002 and was the IRS’ Deputy Chief Financial Officer for Strategic Planning and Budgeting where she directed the IRS strategic planning and budgeting from 1998 to 2002. Prior to IRS, Ms. Turco was an examiner at the Executive Office of the President’s Office of Management and Budget for 10 years. She began her career with the Department of Education. Ms. Turco was the recipient of a 2006 Presidential Rank Award as a meritorious executive and the 2008 Donald L. Scantlebury Memorial Award for Distinguished Leadership in Financial Management Improvement. She is a member of U.S. Chief Financial Officers Council and the Office of Federal Procurement Policy’s Cost Accounting Standards Board. Ms. Turco has an undergraduate degree from the University of Maryland and a Master’s in business administration from the University of West Florida. In December 1995, GSA created the Office of Governmentwide Policy (OGP) to consolidate its policy functions into a single organization. OGP’s policymaking authority covers the areas of personal and real property, travel and transportation, information technology, regulatory information and use of federal advisory committees. OGP’s strategic direction is to ensure that governmentwide policies encourage agencies to develop and utilize the best, most cost effective management practices for the conduct of their specific programs. To reach the goal of improving governmentwide management of property, technology, and administrative services, OGP builds and maintains a policy framework, by (1) incorporating the requirements of federal laws, Executive Orders, and other regulatory material into policies and guidelines, (2) facilitating governmentwide reform to provide federal managers with business-like incentives and tools and flexibility to prudently manage their assets, and (3) identifying, evaluating, and promoting best practices to improve efficiency of management processes. Guided by the principles of the President’s Management Agenda and the Office of Management and Budget (OMB), some of OGP’s recent efforts have been devoted to providing leadership in the development of a policy environment and key enablers for electronic government, and supporting OMB in the implementation of various E-Gov initiatives to standardize and streamline government processes. The new model calls for involvement of other federal agencies, the private sector, interested parties, and other stakeholders from the very onset of policy review and/or formulation. Such collaborative efforts are seen to offer numerous advantages, not least of which is to ensure “buy-in” from the policy customers.